In nearly every year the grim chronicle of bungled executions and lackadaisical hangmen was extended … [William] Calcraft the hangman simply miscalculated the drops required to effect a speedy death. In office since 1829, Calcraft was ‘a mild-mannered man of simple tastes, much given to angling in the New River, and a devoted rabbit fancier’. Nice to rabbits, he had a casual way with people. He hanged them like dogs, it was said. Another dismal apotheosis was reached in the Newgate execution of William Bousfield in 1856. The night before his execution Bousfield* tried to kill himself in his condemned cell by throwing himself into the fire; next morning [March 31, 1856] he had to be carried to the scaffold swathed in bandages. Calcraft was nervous; he had received a letter threatening his assassination. 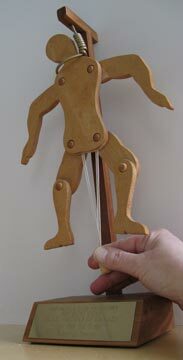 He pulled the bolt to let the drop fall and disappeared hastily into the prison. Astonishingly, Bousfield drew himself up and lodged his feet on the side of the drop. Pushed off by a turnkey, he again found the side of the drop; and yet again. He was defeated only when Calcraft was summoned back to drag on his legs and ‘the strangulation was completed’. In front of an angry crowd, Bousfield gurgled his way to death as church bells rang to celebrate the end of the Crimean War. After this debacle, they started pinioning the prisoners’ legs to prevent them getting a foothold on the scaffold, removing any hope of preservation to the inscrutable hand of Providence. * Charles Dickens scribbled a few rambling thoughts on the subject of Bousfield’s trial. 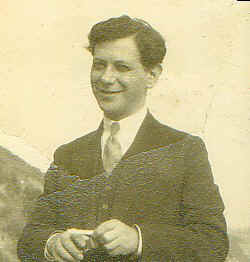 On this date in 1938, Arkadi (or Arcadi) Berdichevsky, a Russian Jew run afoul of the (pre-KGB) NKVD, was executed in the Arctic Circle prison town of Vorkuta for leading a prisoners’ hunger strike. Though the powerful whom Stalin purged are well-known to the student of Russian history, Berdichevsky is just one of the countless obscure Soviet citizens who disappeared into the gulag never to emerge again. Berdichevsky had something most of his fellow-victims did not: an English wife. Freda Utley and her son Jon Utley — the couple cannily gave the boy his mother’s foreign last name to make it easier to emigrate if it should come to that, as indeed it did — left the USSR and Freda’s communist youth for fame as (paleo)conservative giants. While young Jon — just two years old when his father was whisked out of their Moscow flat by the spooks — came of age, Freda Utley naturalized as an American and turned against her former ideology with the zeal of the converted. Berdichevsky’s widow, Freda Utley, published this book in 1940 about her disillusionment with communism. This work and many others by Utley are also available as free pdfs from FredaUtley.com. Along the way, Freda Utley learned the date of her husband’s death, but never the circumstances. In 2004, Jon Utley finally obtained the remarkably detailed records revealing that it was a firing squad rather than cold or malnutrition that took his father’s life. Utley then personally visited the sites of that Calvary in the Komi region of Russia. Jon Utley gives a video interview about the experience and about his own path as an anti-communist here, but most especially recommended for our purposes is his written account of finding his father: HTML form here; pdf here. Shortly after midnight this date* in 1935, the career of 71-year-old Canadian executioner Arthur Ellis came to an end with the botched hanging of Thomasina Sarao. All a simple matter of physics. When the old-school “drop ’em from a cart” method of strangulation hanging gave way to the “new drop”, the hangman’s art eventually came to encompass the scientific application of the humane level of force to the doomed person’s vertebrae. Something in the neighborhood of 1,000 ft/lbs was about right. Too little, and the poor wretch strangles to death. Too much, and you rip the head right off. Thomasina Sarao got too much, and it ripped her head right off. Except in the widow Mrs. Sarao’s case — the Italian immigrant had offed her husband to collect the insurance** — Arthur Ellis was given the wrong weight for his client. He coiled a noose for a woman 32 pounds lighter than the person who actually mounted the scaffold, and he therefore made it more than a foot too long. That whole “ripping off a woman’s head” thing really harshed everyone’s vibe. So, although hangings had long been moved behind prison walls, the Canadian government stopped the ongoing practice of allowing members of the general public to obtain tickets to witness them. “Arthur Ellis” — it was actually a trade name he’d made up, and so dignified that one of his successors used the same alias — died three years after his grisly retirement party. He’s saluted by the Arthur Ellis Awards, the Crime Writers of Canada’s annual awards: a little trophy of a guy getting hanged. * March 28 is sometimes reported, but the period press reports (like this wire story) seem to agree on the 29th, as does this index of Canadian executions. ** Two male co-conspirators, Leone Gagliardi and Angelo Donofrio, were also hanged for the same crime, a few minutes before Sarao on a different scaffold. 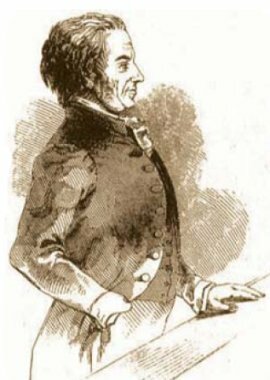 On this date in 1845, John Tawell was publicly hanged in Aylesbury (while broadsheets were hawked beneath the scaffold to the crowd of thousands) for the murder of his mistress — making history as the first criminal apprehended with the use of the telegraph. 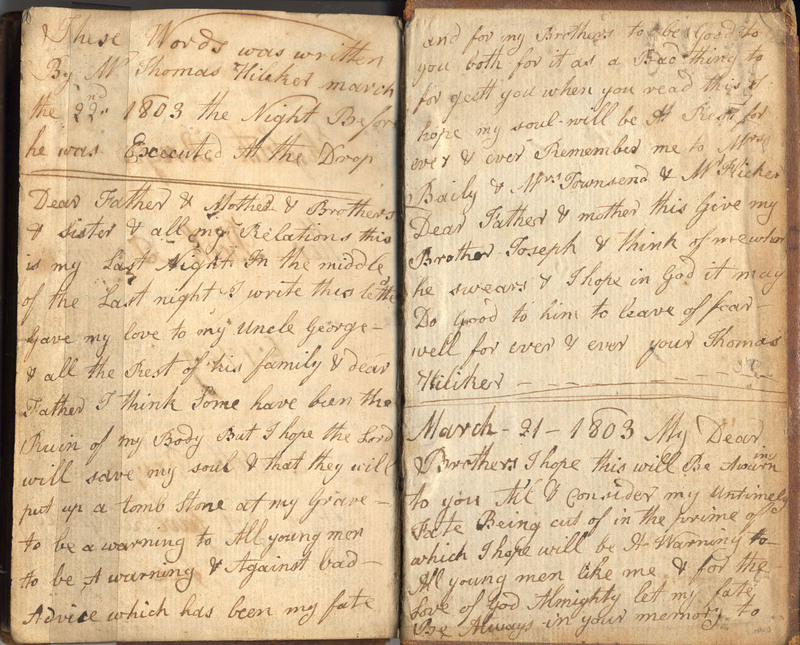 Tawell returned to England in 1831, got Sarah Hart as a bit on the side (she’d initially been hired to nurse Tawell’s dying wife), and then married a respectable Quaker woman. To conceal the affair — or perhaps because the payola Tawell was obliged to send for the maintenance of his mistress and the kids he begat with her was chewing into his straitened finances — Tawell poisoned Hart on New Year’s Day 1845. Unfortunately for him, he was noticed leaving the scene of the crime by a neighbor, who found the victim before she had even expired. 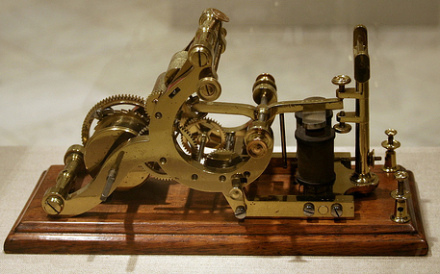 Tawell had hopped a slow train for London ahead of apprehension, but it transpired that the station had installed the newfangled telecommunications device, the telegraph, which was requisitioned to dispatch to Paddington station a famous missive. A murder had just been committed at Salt Hill and the suspected murderer was seen to take a first class ticket to London by the train that left Slough at 7.42pm. He is in the garb of a Kwaker with a brown great coat on which reaches his feet. He is in the last compartment of the second first-class carriage. Caught, convicted,† condemned. (And confessed, secretly, to the prison chaplain.) The usual. Botched strangulation hanging. Hardly unusual. Love triangle murder? Downright trite. In Australia, the memory of Tawell lingered for many years after his death because considerable legal argument took place about the validity of the Crown’s hndling of his property there. The Governor, Sir William Denison, affixed the Great Seal of the colony to the grant documents on his own initiative, which creted a serious difference between him and his chief minister. Known as the “Great Seal case”, it dragged on for some 16 years before it was resolved. It provided a dramatic epilogue to Tawell’s activities. John Tawell had pharmacy qualifications of a sort, and he was no better or worse than many of the doctors around Sydney at the time who had received no regular professional instruction. When Tawell ventured into competition with the medical establishment in the colony it was a huge gamble because until 1820 many government doctors saw private patients and had clerks to do their dispensing, usually from hospital stores. He showed that independent pharmacy could thrive away from the medical shadow, but the commercial nature of his success also showed that the founding of independent pharmacy in Australia occurred as a retailing activity rather than as a needed profession. * As a teen, Tawell was friends with a Quaker linen-draper who was himself ultimately executed for forgery, Joseph Hunton. ** This claim for bankers’ gentility is advanced in the context of the story of a banker who in fact went on to commit murder. Aside from that obvious paradox, it will come as no surprise to any denizen of the post-bailout neoliberal era that bankers proved more than ready to involve themselves in human misery, sufficiently remunerative. If Tawell’s sweetheart plea bargain reveals anything about the financier class, it’s that bankers aren’t keen on precedents for taking away bankers’ lives. This attempted Chewbacca defense earned the barrister the nickname “Apple-pip Kelly”. However, since the cutting-edge technology of the day was only telegraph and not Twitter, the case does not appear to have launched any of Apple-pip Kelly’s progeny into lucratively pointless careers as famous-for-being-famous socialites. Two men were beheaded in Riyadh on this date in 2009 for bizarrely causing a man’s death in an unarmed purse-snatching. An Interior Ministry statement says Faisal bin Fahd and Bandar bin Abdullah first stole the Chinese man’s laptop bag while he was walking. When the man tried to catch up with them, he fell and died after hitting his head on the pavement. 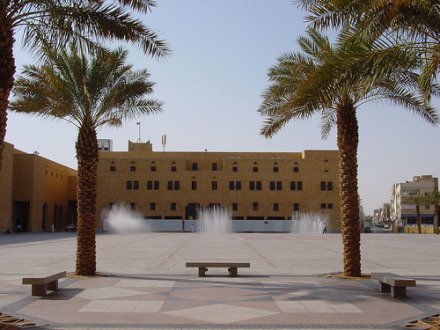 “Chop-Chop Square” in Riyadh, the site of public executions. 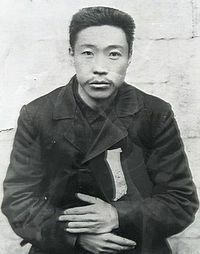 A century go today, Korean independence martyr Ahn Jung-geun (or An Jung-geun) hanged at Port Arthur for assassinating Japanese statesman Ito Hirobumi. Ahn Jung-geun, who was also a skilled calligrapher (his epigram, “Unless reading everyday, thorns grow in the mouth” is well-known in Korea), actually had a more visionary pan-Asianist agenda than his nationalist byline might initially suggest. But he militantly opposed Japan’s annexation of the peninsula, and won his hero stature for gunning down Ito in Manchuria. Ito, for his part, is a national hero in Japan for establishing that country’s parliamentary government and serving as its first Prime Minister. So, yeah. Still a spot of tension over this incident. Because the Japanese worried that “if Ahn Jung-geun’s body is handed over to the surviving family or impudent Koreans … it will not be good in the future,” its ultimate deposition has become an enduring historical mystery, with China the current likely suspect. Koreans’ intensified hunt for records pointing to Ahn’s grave has been much in the news during the centennial run-up. Wherever his bones rest, the Korean patriot (as the saying has it) lives on. He’s even been posthumously promoted by the South Korean army to the rank of “General”. The recent Korean film 2009 Lost Memories is premised on an radically different alternate timeline starting when Ahn is prevented from killing Ito. Here’s its aesthetically appealing climax, when history is righted. Scrabbel put the Ahn Jung-geun story to music. 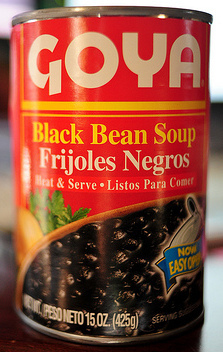 This date in 1843 was a good one to just stick with the guacamole. Though the Republic of Texas (it would join the United States in 1846) had won its independence from Mexico a few years before, hostilities between the two continued. Skirmishes in the frontierlands at length triggered a Texan reprisal-slash-plundering expedition. The officially independent Somervell Expedition of volunteer Texan militiamen captured a couple of Mexican towns, then disbanded to go home. Those members of it optimistic about their chances for more raiding set off for Ciudad Mier* — the Mier Expedition. The Mier Expedition was a flop, and the irate Mexican President Santa Anna ordered the entire band shot to make an example. Anglo diplomatic wrangling got him to go down to shooting one tenth of the band. Well, you’ve gotta pick that tenth somehow. So on this day, 176 potentially condemned men were made to draw a bean from a pot containing 159 white ones and 17 fatal black ones. I knew then that I was safe, and the revulsion of feeling was so great and rapid that I can compare it to nothing except the sudden lifting of an immense weight from off one’s shoulders. I felt as light as a feather. The most hated man (by the Mexicans), Ewen Cameron, pulled white, but Santa Anna thought better of letting him draw air and had him separately executed a month later. The rest of the lottery’s “winners” languished in prisons and work camps for more than a year of continued Texas-Mexico hostility, until they were amnestied and released in September 1844 — many destined to renew hostilities in the imminent Mexican-American War. That survivor quoted above, William “Bigfoot” Wallace, was one of those re-enlistees. His colorful career with the Texas Rangers earned him a minor star in the firmament of Americana; he appears in Larry McMurty’s Lonesome Dove prequel Dead Man’s Walk … only in that version, he gets cinematically black-beaned at the big moment, as in this clip from the miniseries of the same title. * The town is latterly famous as a key transit point for arms smuggling to Fidel Castro to supply the Cuban Revolution. 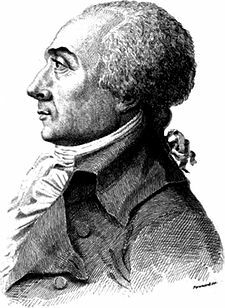 On this date in 1794, firebrand revolutionary pamphleteer Jacques Hebert and his eponymous party of Convention radicals mounted the scaffold during the Paris Terror. As a 32-year-old, Hebert started putting out his foul-mouthed blog radical newspaper Le Pere Duchesne in the Revolution’s early months. In this increasingly vituperative rag, Hebert — incongruously writing in the voice of “Old Man Duchesne” — savaged first the royal couple, and then (after that pair lost their well-coiffed heads) whatever the retrograde element of the unfolding Revolution happened to be on any given day: the constitutional monarchist Lafayette; the bourgeois liberal Girondists. His paper valorized the Parisian working-class sans-culottes, and lustily demanded heads for the satisfaction of their various grievances. All of these thoughts trouble my brain, and the memory of Marat follows me without end. Last night I saw him in a dream: his wound was still bleeding, dammit. Upon seeing it I cried. Friend of the people, I shouted, is it you? Yes, good Père Duchesne, it’s Marat who comes from the dead to talk with you, because — dammit — the love of freedom pursues me even beyond the grave. Content to have lost my life for my republic, there only remains to me the regret of not having seen it delivered, before my death, from all the scoundrels who tear away at its breast. Père Duchesne, you must do what I couldn’t do. You closely followed me in the revolution; like me you consecrated you life to the defense of the rights of the people. You speak the language of the Sans Culottes, and your foul mouth, which makes little mistresses faint, sounds beautiful to free men, for free men shouldn’t be sought among the beautiful souls. Your joy and your anger have done more than all the dreams of statesmen. They know this well, the worthless fucks, and that’s why they’ve persecuted you like they did me. Courage, old man; don’t back off when you suffer the same trials as me, don’t be afraid: is there a more beautiful death than mine? But since you’re useful to your fellow citizens, try to avoid the daggers of statesmen. Live a while longer in order to denounce them and to complete, if you can, the task I’d undertaken. Eleven days after Le Pere Duchesne last hit the streets, its author’s head hit the basket. His printed editorials (like the one above) often assert a modish conviction in his own coming martyrdom, but as proof against a fatal political reversal, Hebert had trusted overmuch to his power base in the Paris commune. When he was carted out this morning, the mob whom his own paper once played to reveled in old Pere Duchesne’s fall just as readily as it had reveled in his enemies’. The original La Pere Duchesne was dead, but just as the hot-selling mag had attracted ripoffs in its original run, the name lived on as a symbol of popular revolutionary menace — to be reclaimed by later generations in print and song. * I know, right? Hebert was such a wild man, he thought ill of slavers. Everywhere and at all times men of commerce have had neither heart nor soul: their cash-box is their God; they only know how to thieve and deceive; they would shave an egg, they would kidnap their own fathers; they traffic in all things, even human flesh; theirs are the ships which sail to the African coasts to capture negroes whom they then treat as worthless cattle. ** These rival factions linked as fellow-victims of Robespierre’s Terror are neatly symbolized by the spouses of their respective antipathetic scribblers: Jacques Hebert’s wife Marie, and Lucile Duplessis, wife of the Dantonist journalist Camille Desmoulins. Marie and Lucile were guillotined together that April, having forged a friendship while awaiting the chop. † “The personal enemy of Jesus Christ,” Cloots called himself. He also remarked, “What is man’s chief enemy? Each man is his own.” A lot of enemies, this one had. On this date in 1526, Spanish bishop Antonio Osorio de Acuña was beheaded in Simancas for supporting the revolt of the comuneros. Acuna was in his sixties when the popular revolt rose in Castile. Given his age and station, he might have been expected to exercise the bishopric of Zamora in the interests of the powers that be. Instead, he threw in with the rebels, even fearlessly leading men into battle. If that sounds (rightly or wrongly) principled to you, you might be surprised that Acuna has generally been tarred as an opportunist. Was it “opportunistic” to seize the vacant bishopric of Toledo when that city was under attack by royalists? Or was it a courageous and needful stroke to take the ecclesiastical power in hand and direct the church’s material resources to the cause? It’s really all in how you look at it. Surely throwing dissenting priests into the dungeon was a little harsh, but then, it was wartime. Acuna was caught fleeing for France after the revolt broke down, but his execution took four-plus years to arrange through the sluggardly church courts. Still, he was executed — a fact which underscores the stakes he was playing for, and insured that he would never get the benefit of historiographic doubt. This Spanish-language page summarizes Acuna’s pre-comuneros career of graft and careerism. This Castilian nationalist page likes him quite a lot better. On this date in 1803, 19-year-old apprentice Thomas Hilliker (or Helliker, or Heliker, or Hiliker) was hanged on doubtful eyewitness identification for having helped torch Littleton Mill near Semington during an anti-mechanization protest. The youth’s affecting handwritten last letter, on display at the Trowbridge Museum, was recently selected by the BBC for its “History of the World in 100 Objects” series. “Remember my last Fate …” Detail view of Thomas’s letter, as seen in the BBC series. (For the full letter: page 1; page 2) Images (c) Trowbridge Museum, and used with permission. Executed Today is pleased to mark the anniversary of Thomas Hilliker’s hanging with a chat with Trowbridge Museum Curator Clare Lyall. ET: Can you put in context the significance of burning down a mill in Wiltshire in the early 1800s? CL: This was part of organized resistance against mechanization that had begun to turn violent. Mills at Warminster and Bedington had already been burned. There was widespread opposition to processes that were perceived as threatening jobs and this was indicated by many employees joining unions despite the union’s illegal status. Thomas Hilliker was 19 when he died. What do we know about him? What kind of life did he lead? 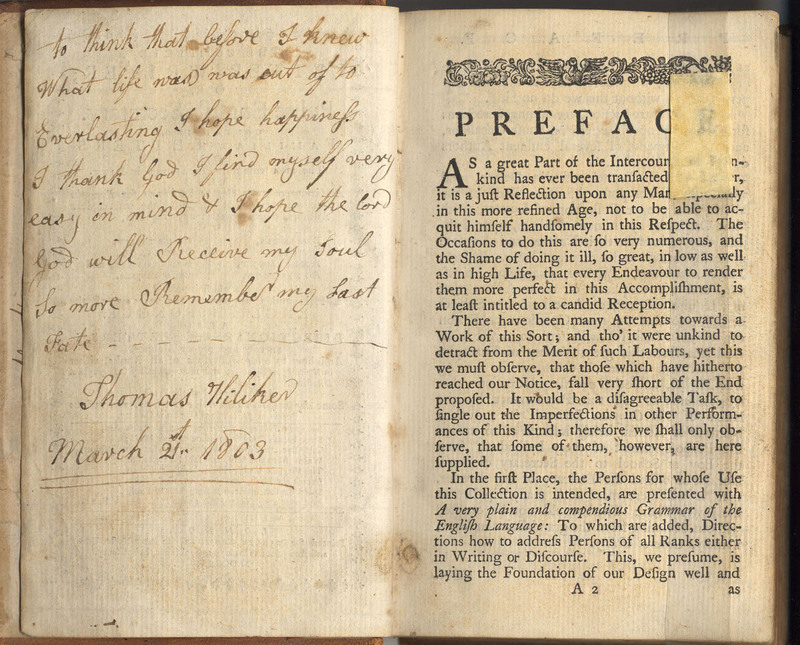 Thomas was a literate, apprentice shearman. The job of a shearman was highly skilled and involved the cropping of the raised nap of the cloth to ensure that a finely knitted fibre remained. He was only two years into a five-year apprenticeship when he was arrested. We have little evidence about the type of life he led. There was a statement that gave him an alibi for the night of the burning down of Littleton Mill, when one of his friends found him drunk outside a cottage where he had been visiting and took him in there to spend the night in the kitchen. I guess from that we can conclude that like many teenagers he liked on occasion to drink alcohol to excess. You’re quoted on thisiswiltshire.co.uk as saying that Hilliker “was probably the wrong guy.” Was he wrongfully executed? There were contradictory statements about whether Hilliker was actually there holding the Mill manager prisoner whilst the Mill was burned. He also had an alibi for that evening and it would have been very unusual for senior union men to have involved a junior member with such a serious event. I think all this casts doubt on his guilt. 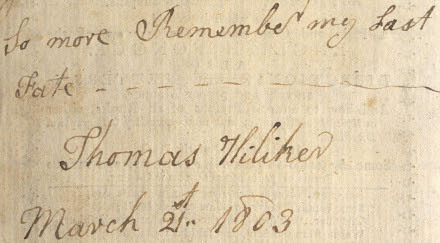 What did Thomas have to say to his family in this last letter? What does that tell us about his life? It was a moving farewell to his parents and siblings with a request for them not to forget him and to stay out of trouble. I don’t think this was an admission of his involvement in the Littleton Mill incident but may refer to his membership of an illegal organization, a union which after what had happened to him might have considered wasn’t worth the risk. As a curator, how do you present this artifact to visitors? What kind of reactions does it typically draw? We present the letter in a display case which has a controlled environment and subdued lighting. There is a transcription of his final letter that is displayed on the outside of the case and adjacent to the letter. Many people are moved by the letter and why he never told who the true culprits were.